WileyPLUS Learning Space is an example of a proprietary learning management system. ® John Wiley & Sons. Used with permission. Integrating interactive web maps with other digital content will make nextgen textbooks come alive. Textbooks are changing. So is the textbook industry, which accounted for almost $14 billion in US sales in 2013. The high cost of printed texts is driving change. The Student Public Interest Research Group estimates that full-time US college students, on average, spend nearly $1,200 per year on textbooks. Mounting public concern over the high cost of education in general, and textbooks in particular, is forcing publishers away from printed books toward a new generation of less expensive digital products. Esri is interested in the future of textbooks because they affect millions of young people every year and because Esri web maps have the potential to make textbook maps come alive. In 2013, The Chronicle of Higher Education published an article called "The Object Formerly Known as Textbook." This article and others like it report that textbook publishers are actively rethinking what textbooks and the textbook business should be. For years, textbooks have been marketed as bundles of content—primarily print, but with digital ancillaries—rather than just books. While this rethinking process is in progress, one thing is clear: the mix of digital and print content in next generation, or nextgen, textbooks will flip. Most of us assume that the digital alternative is an e-book that retains much of the look and feel of printed textbooks but with added features like highlighting and note-taking, links to web resources, and compatibility with mobile devices. Plenty of e-textbook titles are available, including those available from Barnes and Noble for its Yuzu platform; from Amazon.com; and especially CourseSmart, which claims to offer access to e-textbooks for more than 90 percent of the core content higher education titles at up to 60 percent off the cost of print editions. Other content providers offering digital alternatives include Inkling, Kno.com, and Discovery Education. However, as Digital Book World observed, "students just aren't taking to e-textbooks … but they are taking to what higher education publishing insiders call 'integrated learning systems'" that bring together a variety of resources. A 2013 EDUCAUSE report observed "once e-textbooks embrace the full capabilities of digital formats, the possibilities are extensive and may even be transformational." An example of a web map that expands the usability of a map illustration that appears in a leading US history textbook. 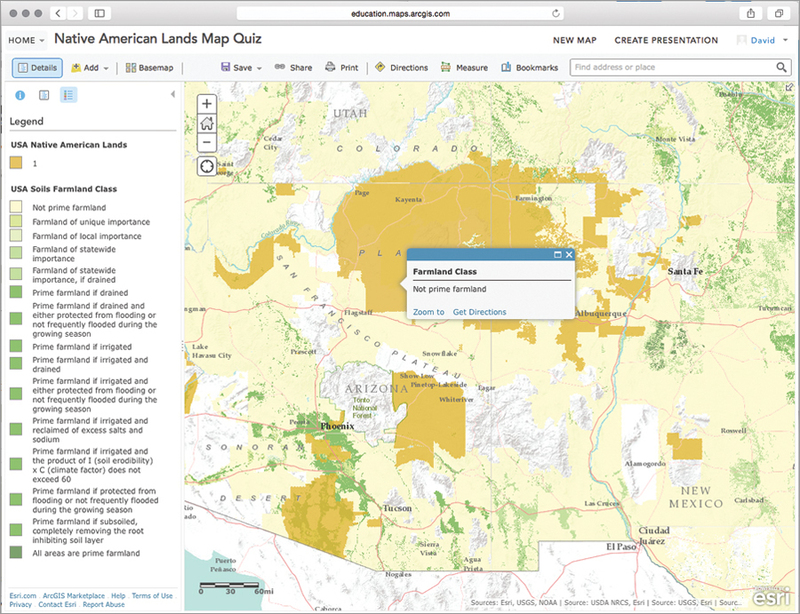 The web map enables students to explore, interpret, and explain the environmental and economic conditions within Native American lands. That's why "the object formerly known as textbook" is beginning to resemble an online course more than an e-book. Leading textbook publishers like McGraw-Hill Education (Networks), Houghton Mifflin Harcourt (Dashboards), and John Wiley & Sons (WileyPLUS Learning Space) are all launching proprietary learning management systems (LMSs). LMSs typically combine digital content with assessment tools like quizzing, instructor dashboards, grade management tools, course e-mail, and other support for social learning. Esri sees an opportunity to make a difference in these nextgen learning environments by integrating interactive web maps with other digital content. For example, Esri is currently working with John Wiley & Sons and partner Maps.com to integrate ArcGIS Online web maps into a forthcoming nextgen text on world regional geography. The Learning Tools Interoperability specification enables seamless and secure integration of web maps with other LMS functionality. 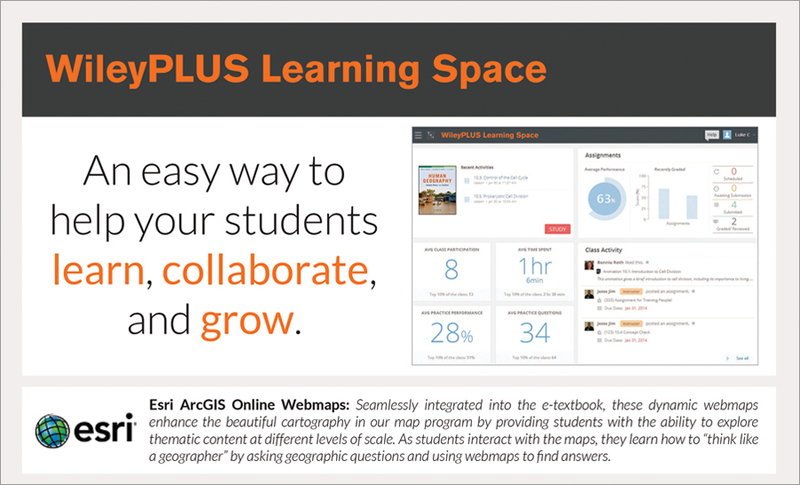 Integration with online quizzing and discussion enables educators to transform maps from mere illustrations to a learning technology that facilitates geographic inquiry. As a result of this process, Esri sees the potential to help transform geography—as it is commonly misunderstood by many students and teachers—from triviality to importance in texts on many subjects. Changes in the textbook industry will play out over the coming decade. Observers predict that students now in middle school will expect digital alternatives by the time they reach college. Supporting this prediction is the fact that while only 2 to 3 percent of textbook sales at college bookstores were fully digital in 2010 (according to a survey cited in The Chronicle of Higher Education article), revenues from digital products for K–12 schools increased 46 percent from 2008–10 and 18.4 percent in 2011 alone. These digital products aren't just e-texts. Some already include web maps. For example, Maps.com's Field Trip Library uses Esri Story Map apps to present media-rich narratives for teaching and learning history, geography, science, and popular culture. More digital educational products that integrate web maps will appear this year. Nextgen students will come to higher education with greater expectations of what maps can and should be. Esri's contribution to President Obama's ConnectED initiative is an offer to donate ArcGIS Online subscription accounts to any public, private, or home school in the US and provide the curriculum solutions, professional development for teachers, and geomentors needed to support meaningful usage in 25,000 schools by 2017. Thousands of pupils every year are discovering that web maps make geography come alive. They'll expect even more when they go on to college. Esri is urging educators—and especially textbook authors and editors—to have higher expectations too. Geoenabled education is one of the transformative potentials of nextgen textbooks. David DiBiase leads the education team at Esri. The team promotes and supports GIS use to enrich teaching and learning at all levels, in formal and informal settings, domestically and internationally. Before joining Esri, DiBiase founded and led the Penn State Online GIS Certificate and Masters (MGIS) degree programs.